SMYRNA, Del. 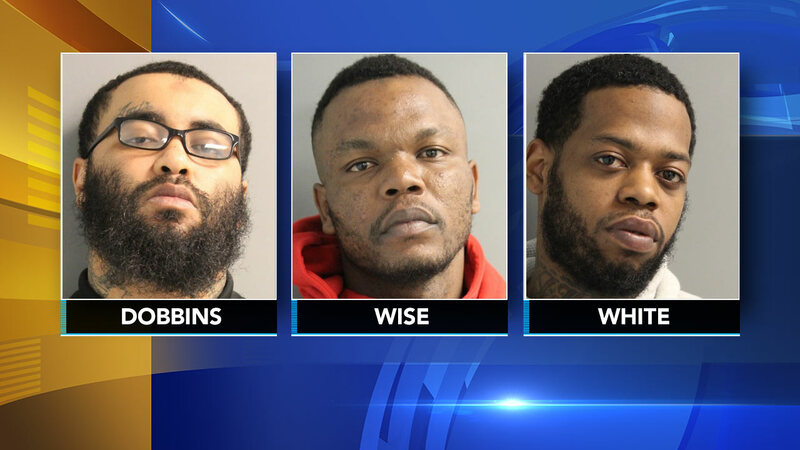 (WPVI) -- Three men were arrested after a traffic stop led to a big drug bust in Smyrna, Delaware. Their vehicle was pulled over for registration violations on Route 13 in Monrovia Avenue on Wednesday night. Police say that, during the stop, an officer suspected illegal substances may have been in the vehicle. A subsequent search allegedly revealed 2,405 bags of heroin and more than $1,300 in suspected drug proceeds. Items seized during a drug bust in Smyrna, Delaware on March 28, 2018. James Dobbins, 30, of Dover, Kiree Wise, 27, of Newark and John White, 28, of Wilmington were taken into custody. Police say Dobbins managed to escape from the back of a patrol car and fled while handcuffed, but he was found a short distance away and was re-captured following a struggle.